For other uses, see Gideon (disambiguation). 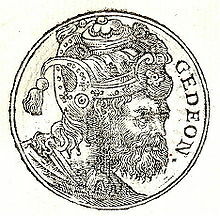 Gideon (/ˈɡɪdiən/) or Gedeon,[a] also named Jerubbaal,[b] and Jerubbesheth, was a military leader, judge and prophet whose calling and victory over the Midianites are recounted in chapters 6 to 8 of the Book of Judges in the Hebrew Bible. Gideon was the son of Joash, from the Abiezrite clan in the tribe of Manasseh and lived in Ephra (Ophrah). As a leader of the Israelites, he won a decisive victory over a Midianite army despite a vast numerical disadvantage, leading a troop of 300 'valiant' men. 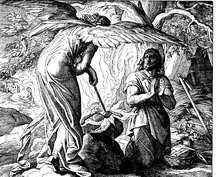 The nineteenth-century Strong's Concordance derives the name "Jerubbaal" from "Baal will contend", in accordance with the folk etymology given in Judges 6:32. According to biblical scholar Lester Grabbe (2007), "[Judges] 6.32 gives a nonsensical etymology of his name; it means something like 'Let Baal be great.'" Likewise, where Strong gave the meaning "hewer" to the name Gideon, biblical scholar Simon John DeVries (1975) suggests the etymology "driver." According to modern scholars, the use of both names "Gideon" and "Jerubbaal" reflects two originally independent sets of stories combined by an editor who wishes them to be seen as referring to a single character. As is the pattern throughout the Book of Judges, the Israelites again turned away from Yahweh after 40 years of peace brought by Deborah's victory over Canaan, and Midianites, Amalekites and other Bedouin peoples who harried Israel for seven years. God chose Gideon, a young man from the tribe of Manasseh, to free the people of Israel and to condemn their idolatry. The Angel of the Lord, or "the Lord’s angelic messenger" (Judges 6:11 NET) came "in the character ... of a traveller who sat down in the shade [of the terebinth tree] to enjoy a little refreshment and repose" and entered into conversation with Gideon. The narrative has echoes of the meeting between Abraham and the visitors who came to him in the terebinth trees of Mamre and promised Abraham and Sarah, in their old age, that they would have a son (Genesis 18:1-15). The Lord is with you, you mighty man of valor! Gideon requested proof of God's will by three miracles: firstly a sign from the Angel of the Lord, in which the angel appeared to Gideon and caused fire to shoot up out of a rock (Judges 6:11-22), and then two signs involving a fleece, performed on consecutive nights and the exact opposite of each other (Judges 6:36-40). Therefore on that day he (Joash) called him Jerubbaal, saying, Let Baal plead against him, because he hath thrown down his altar. He went on to send out messengers to gather together men from the tribes of Asher, Zebulun, and Naphtali, as well as his own tribe of Manasseh, in order to meet an armed force of the people of Midian and the Amalek that had crossed the Jordan River, and they encamped at the Well of Harod in the Valley of Jezreel. But God informed Gideon that the men he had gathered were too many – with so many men, there would be reason for the Israelites to claim the victory as their own instead of acknowledging that God had saved them. God first instructed Gideon to send home those men who were afraid. Gideon invited any man who wanted to leave, to do so; 22,000 men returned home and 10,000 remained. Yet with the number, God told Gideon they were still too many and instructed him to bring them to the water. All those who lap the water with their tongues, as a dog laps, you shall put to one side; all those who kneel down to drink, putting their hands to their mouths, you shall put to the other side. The number of those that lapped was three hundred; but all the rest of the troops knelt down to drink water. Then the Lord said to Gideon, “With the three hundred that lapped I will deliver you, and give the Midianites into your hand. Let all the others go to their homes.” (Judges 7:4–7). During the night, God instructed Gideon to approach the Midianite camp. There, Gideon overheard a Midianite man tell a friend of a dream in which "a loaf of barley bread tumbled into the camp of Midian" (Judges 7:13), causing their tent or camp to collapse. This was interpreted as meaning that God had given the Midianites over to Gideon. Gideon returned to the Israelite camp and gave each of his men a trumpet (shofar) and a clay jar with a torch hidden inside. Divided into three companies, Gideon and his 300 men marched on the enemy camp. He instructed them to blow the trumpet, give a battle cry and light torches, simulating an attack by a large force. As they did so, the Midianite army fled (Judges 7:17–22). Gideon sent messengers ahead into Israel calling for the Ephraimites to pursue the retreating Midianites and two of their leaders, Oreb and Zeeb. Gideon and the three hundred pursued Zebah and Zalmunna, the two Midianite kings. When he had asked for provisions in his pursuit, the men of Succoth and Peniel refused and taunted Gideon. After capturing the two kings, Gideon punished the men of Succoth, and pulled down the tower of Peniel killing all the men there. Gideon invited his eldest son, Jether, to slay Zebah and Zalmunna, but being still young at the time, he did not have the confidence to carry out his father's request, so Zebah and Zalmunna called on Gideon to perform the deed himself. Gideon then killed Zebah and Zalmunna as justice for the death of his brothers (Judges 8:19-21). The Israelites invited Gideon to become their king and to found a dynasty, but he refused, telling them that only God was their ruler (Judges 8:22-23). G. A. Cooke, writing in the Cambridge Bible for Schools and Colleges notes the discontinuity between Ephraimite anger towards Gideon shown in Judges 8:1-3 and the proposition of kingship over [all] Israel, and therefore concludes that "these verses appear to come from a [secondary] source". Gideon went on to make an ephod out of the gold won in battle, which eventually caused the whole of Israel to turn away from God yet again. Gideon had 70 sons from the many women he took as wives. He also had a Shechemite concubine who bore him a son whom he named Abimelech, which means "my father is king" (Judges 8:31). There was peace in Israel for 40 years during the life of Gideon. As soon as Gideon died of old age, the Israelites again turned to worship the false god Baal-Berith and ignored the family of Gideon (Judges 8:33). In the early twentieth century, the text of Judges 6–8 was regarded by the "critical school" as a composite narrative, combining Jahwist, Elohist and Deuteronomic sources, with further interpolations and editorial comments of the Second Temple period. Emil Hirsch alleged a historical nucleus in the narrative, reflecting the struggle of the tribe of Manasseh with hostile Bedouins across the Jordan, along with "reminiscences of tribal jealousies on the part of Ephraim" in the early period of Hebrew settlement, later conflated with the religious context of connecting Yahweh with the shrine at Ophrah. The core (Jahwist) narrative consists of Gideon wishing to avenge the death of his brothers, gathering 300 men of his own clan and pursuing the Midianite chiefs Zebah and Zalmunna, slaying them and consecrating an idol (ephod) made from the spoils of war, which makes his city of Ophrah the seat of an oracle and giving Gideon himself the status of a rich chief with a large harem (Judges 8 4:4-10a, 11-21, 24-27a, 29-32). The name Jerubbaal given to Gideon is originally a theophoric name meaning "Baal strives", but it was later given the interpretation of "let Baal strive against him" in order to avoid conflict with the more rigorous development of the religion of Yahweh in later centuries. Gideon's fleece, as symbol of Mary, in a "Hunt of the Unicorn Annunciation" (ca. 1500) from a Netherlandish book of hours. For the complicated iconography, see Hortus Conclusus. Time would fail me to tell of Gideon [and others] who through faith subdued kingdoms, worked righteousness, obtained promises, stopped the mouths of lions, quenched the violence of fire, escaped the edge of the sword, out of weakness were made strong, became valiant in battle, turned to flight the armies of the aliens. Gideon is regarded as a saint by the Eastern Orthodox/Eastern Catholic and Latin Rite Catholic Churches. He is also commemorated, together with the other righteous figures of the Old Testament, on the Sunday before Christmas (Fourth Sunday of Advent). He is commemorated as one of the Saints of the Armenian Apostolic Church on July 30. He is commemorated in the Roman Martyrology of the Latin Rite on September 26. In the Protestant Reformation, the Gideon narrative was employed in polemics against the Catholic clergy. Hans von Rüte's Gideon (1540) compares the removal of saints' relics from churches to Gideon's destruction of Baal's altar. Gideons International is an American organization dedicated to Christian evangelism, founded in 1899, dedicated to the distribution of free Bibles. The organization's logo represents a two-handled pitcher and torch, symbolizing the implements used by Gideon to scare the Midianite army. Much like the 300 Spartans at Thermopylae, Gideon has become symbolic of military success of a small elite force against overwhelming numerical odds. The 12th-century Prefatio de Almaria invokes "the strength of Samson and the sword of Gideon" in the context of the Reconquista of Almería led by Ponce Giraldo de Cabrera (1147). Benedikt Gletting (16th century) invokes the "Sword of Gideon" in a call for a pious and confident defense of the Old Swiss Confederacy against the threat of the Franco-Ottoman alliance. The Gideon narrative was invoked by Covenanter commander Archibald Strachan prior to Battle of Carbisdale (1650). The Gideon Force was a small British-led special force in the East African Campaign during World War II. ^ For the form Jerubbesheth, see Thomas Kelly Cheyne (1901) . "Jerubbesheth". In T. K. Cheyne; J. Sutherland Black. Encyclopaedia Biblica: A Critical Dictionary of the Literary, Political, and Religious History, the Archaeology, Geography, and Natural History of the Bible. 2, E-K. New York: The Macmillan Company. ^ The Bible (NIV). Zondervan. pp. Judges 7. ^ Strong's Concordance H3378 "יְרֻבַּעַל Yᵉrubbaʻal, yer-oob-bah'-al; from H7378 and H1168; Baal will contend; Jerubbaal, a symbolic name of Gideon:—Jerubbaal"
^ As to "Baal will contend" being an example of folk etymology, see John Muddiman, ed. (25 January 2007). The Oxford Bible Commentary. Oxford University Press. p. 182. ISBN 978-0-19-927718-6. ^ Lester L. Grabbe (25 December 2007). Ancient Israel: What Do We Know and How Do We Know It?. Bloomsbury Publishing. p. 99. ISBN 978-0-567-11012-1. ^ Strong's Concordance H1438 "Gidʻôwn, ghid-ohn'; from H1438 [גָּדַע gâdaʻ 'to hew, chop down']; feller (i.e. warrior); Gidon, an Israelite:—Gideon." ^ a b Simon John DeVries (January 1975). Yesterday, Today, and Tomorrow: Time and History in the Old Testament. Wm. B. Eerdmans Publishing. p. 79. ISBN 978-0-8028-2664-0. ^ Mark S. Smith (3 August 2002). The Early History of God: Yahweh and the Other Deities in Ancient Israel. Wm. B. Eerdmans Publishing. p. 46. ISBN 978-0-8028-3972-5. ^ Yaira Amit (January 1999). The Book of the Judges: The Art of Editing. BRILL. p. 102. ISBN 978-90-04-10827-1. ^ Schwarzenbach, Rudolf, '"... wol uff den hohen alpen fruch"? ein Lied Benedikt Glettings als Quelle des "Vermahnlieds an die Eidgenossenschaft" von Hanns In der Gand', Schweizerisches Archiv für Volkskunde 74 (1978), p. 6 (doi 10.5169).